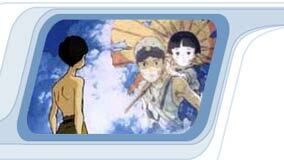 Grave of Fireflies is based on a novel called Hotaru no Haka. It was written by Nosaka Akiyuki and published by Shinchosha. The writer's sister passed away during the war. He felt really guilty and blamed himself for a long time. It is very difficult for me to write what I think about Grave of Fireflies. It is an outstanding movie that is too real and serious to be merely an animation movie. It is painful and I don't know if there are any words to describe the feelings after you watched the movie. It is not a made-up story and you know there are really people out there who went through this kind of suffering and pains. Their situations may not be quite the same as Seita and Setsuko's, but it is the same nightmare to people who went through the war. Sometimes I wonder how can this world be so cruel and unfair to people who are like Seita and Setsuko. My heart is twisted by the movie. The movie is too tragic and too grievous for me to handle my own feelings after I watched it. It is not like some other movies that make you cry on purpose in a very cheap way. You cry because you know if you put yourself in that goddamn war, you would be as hopeless as Seita and Setsuko were. If you have never watched this movie, please take my advice with you---bring as many tissues as you can. I promise you that you will need it sooner or later. This is all I can say about the movie. Without a doubt, Grave of the Fireflies is the most real and the most heart-wrenching movie you will ever see in Anime, and possibly in any medium. Based on the autobiographical novel of a World War II survivor, Grave of the Fireflies follows the effects of the war on Japanese civilians— specifically the two siblings: Seita & Setsuko. The director, Takahata, made this particular anime to be as realistic as possible, and he does it so well, one may wonder why he didn't just make a live-action movie. I'll tell you why: there's no child actor that can portray Setsuko's innocence and feelings as well as it was done in the movie. It's unbelievable how Takahata managed to create such a deep and personal story by setting a slower and more patient pace without it ever crossing over to boredom. The symbolism is done excruciatingly well, as can be seen when Seita must tell Setsuko that she can't see her mother (because she's dead). This scene paints the entire story so well, as you see the little girl drowns in her sorrows, while Seita is helpless to do anything but go in circles trying to do something, but never succeeding. This is probably one of the greatest masterpieces of Anime. Grave of the Fireflies is the saddest movie I ever hope to see. It is a superb production, not to be missed, but you should expect to cry. The 14-year-old boy Seita and his four-year-old sister Setsuko are made homeless by an air raid on the city of Kobe in the final months of World War Two. Their mother is very painfully and fatally injured in that same attack. The children never see their mother alive and conscious again. The story revolves around Seita's pride and resourcefulness in the face of this tragedy. Seita has to grow up fast to take care of himself and Setsuko. He tries to keep Setsuko's spirits up and tries to conceal their mother's death from her. They stay with their aunt at first, but Seita's pride makes him leave when faced with her miserliness and her verbal cruelty. Seita bargains, scavenges, and finally starts stealing systematically, in his effort to get enough food to keep himself and Setsuko alive, an effort that is ultimately unsuccessful.